Videos of the Warwickshire Synchro Championship routines are now available to view here for logged in CoPA members. The 15 and under combination team (Abby, Chloe, Daisy, Jess, Jorja, Katie, Lola, Maddie, Nema and Rachel) took a first place gold! Videos of the routines can be seen here for logged in CoPA members. Please see the events page for details of travel arrangements for the forthcoming Beacon Games. 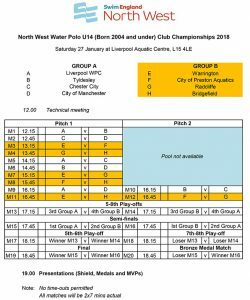 Water Polo players please see the event page for details of the forthcoming NW U14 championships. 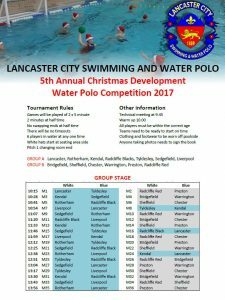 Please see the event page for details of the forthcoming 5th annual Lancaster City Christmas Development water polo competition. It was a fabulous weekend for CoPA at the synchro National Age Groups Championships in Gloucester. At this top level national competition Daisy took the podium for two silver medals! Credible results were also achieved by Rhea, Leah and the 12 & under “Little Monsters”. Full CoPA results below. Daisy placed second in figures and second in solo for two silver medals. Figures: Natasha finished 21st, Lola 76th, Sofia 83rd, Elizabeth 98th, Rachel 104th, Immy 111th, Nema 114th, Chloe 122nd and Abby 126th. Well done girls – on with the 2018 routines now! Saturday saw CoPA put in an outstanding performance at the National Synchro Masters Championships in Rugby. Fiona took gold medals in both the technical and free solo categories in the 40-49 age group and also gained the highest score of the day for her free solo routine. The team (Alex, Ellie, Eloise, Fiona and Sorcha) placed second for a silver medal in their 25-39 year age group combination team routine, missing out on the top spot by only 0.6 of a point! Full results from the competition are available on the Swim England Synchro web site. The full 12 and under figure results were: Natasha 6th, Elizabeth 18th, Sofia 22nd, Immy 23rd, Lola 25th, Rachel 26th, Nema 28th, Abby 31st and Chloe 33rd. Natasha finished 6th in her solo routine. The 13-15 figures were: Daisy 1st and Evie 30th. The 15-18 figures results were: Rhea 3rd and Leah 13th. Videos of the routines can be found here for logged in members. 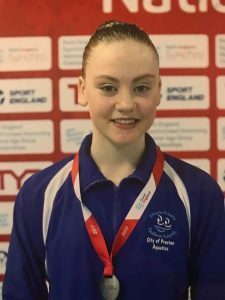 CoPA Success at North West Synchro Championships! In the 12 and under figures competition, Natasha finished 5th, Immy 13th, Sofia 14th, Elizabeth 20th, Abby 21st, Nema 22nd, Lola 24th, Chloe 25th and Jorja 26th. Daisy took gold in the 13-15 figures, whilst Olivia M., finished 12th. The 15-18 figures saw Rhea take a 2nd place silver and Leah finish 4th. In the 13-15 solo event, Daisy took gold. Rhea finished second for another silver in the 15-18 solos and Leah gained a bronze for her third place finish. Rhea and Leah took gold for their 15-18 duet routine. The 12 and under team (Natasha, Elizabeth, Jorja, Chloe, Nema, Abby, Sofia, Lola and Immy) picked up another gold medal for their already award-winning 2017 “Little Monsters” routine. The 13-18 Combination Team (Daisy, Rhea, Leah, Ana, Isabel, Olivia H., and Olivia M.) took a gold medal for their “Fairground Freaks” routine. It goes without saying that the entire CoPA family continues to be very proud of our swimmers. Congratulations to them all on yet more well earned success.